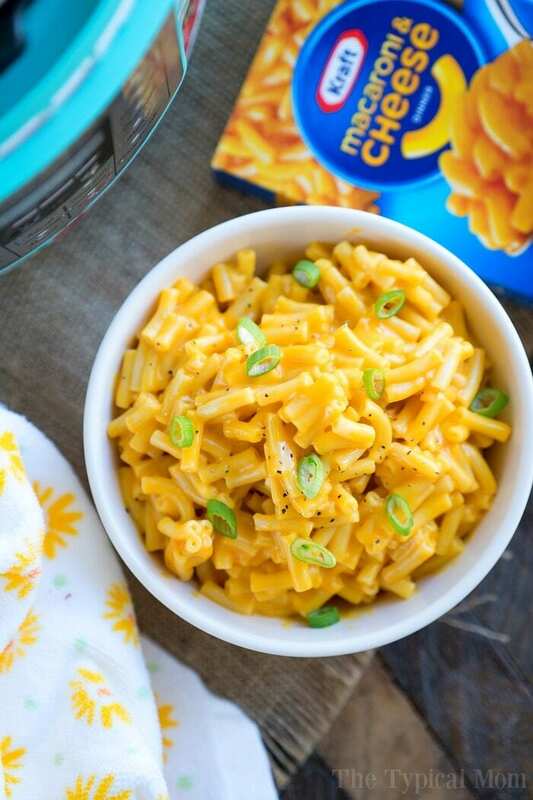 This easy 4 ingredient Instant Pot macaroni and cheese recipe is the best dinner ever! 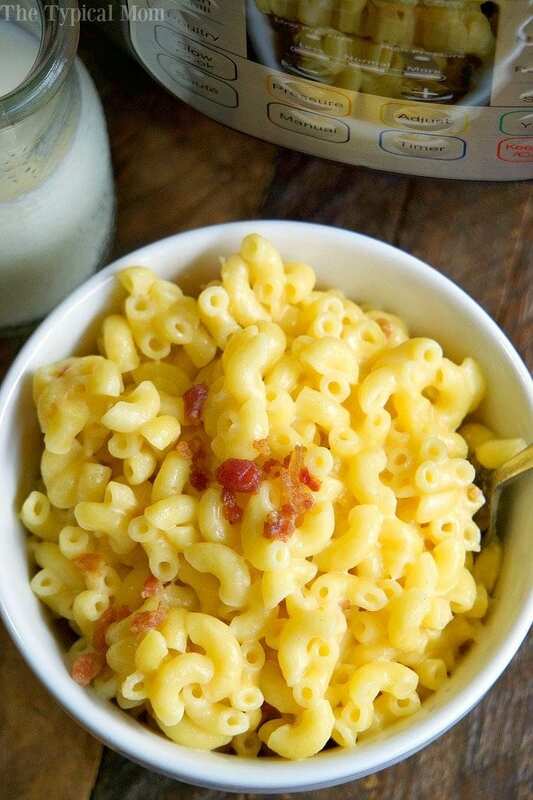 Just 8 minutes to the perfect pressure cooker mac and cheese loaded with creamy cheeses and bacon too if you want. 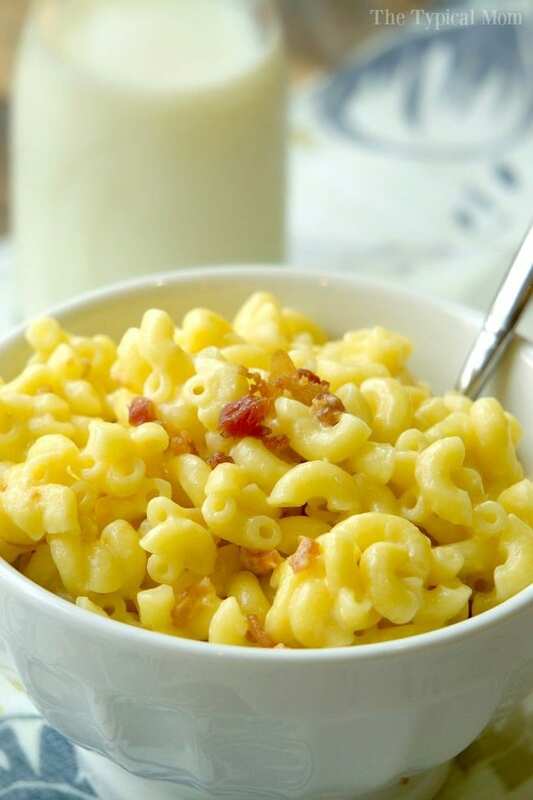 It’s a great after school snack for kids and the quickest homemade macaroni and cheese recipe ever. Oh yum is right huh?? and it’s a great after school snack! Seriously…..amazing, and faster than the boxed version!! Now that’s a huge win. You can use a mixture of different cheese or just use cheddar (sharp is best) which is what we usually do and did here. If you let it sit the sauce will thicken a bit more but we think it is perfect as soon as the cheese is melted and serve it immediately with a pinch of bacon bits on top. It serves the 5 of us just fine with a side of salad for dinner. 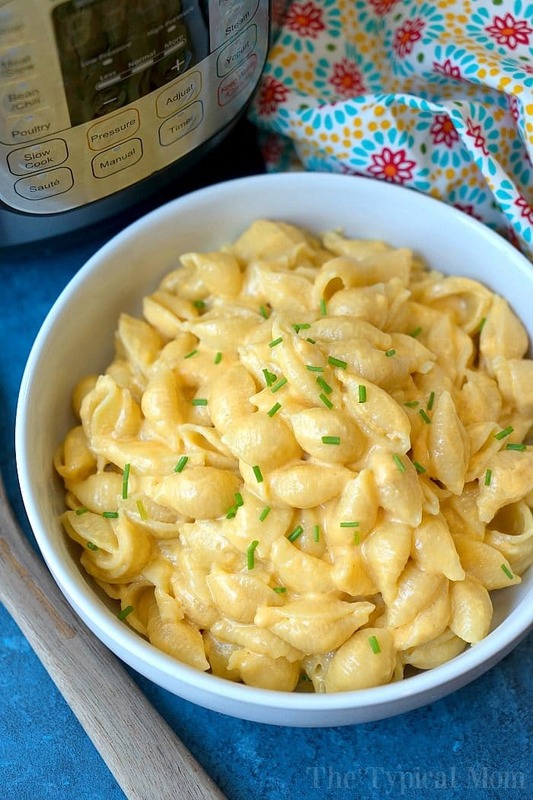 Instant Pot macaroni and cheese is a great after school snack because it’s so quick and easy. If you want to make boxed Kraft mac and cheese in a pressure cooker we have instructions for that too! Set IP to saute low and add your butter (allow to melt), then your evaporated milk (add 3/4 c. then when cheese is melted add remaining 1/4 c if you want it not as thick) then your cheese allowing it to melt and stirring until all cheese is melted and your macaroni and cheese is the consistency you want. To thin it out to your desired consistency add more evaporated milk, or regular milk. Turn IP off. By now sauce should be a bit thicker and ready to serve. Best when eaten immediately! 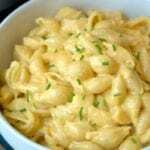 Thank you for Easy and Quick Mac and Cheese recipe!!! I really love the way you made it with evaporated mild. Also I like you choice of cheeses – sharp cheddar, or a mixture of jack and cheddar. You are absolutely right about Instant Pot ability to speed up the cooking process significantly. Recently we made our version of Mac and Cheese in Instant Pot. Choice of cheeses is different – cheddar for the color and tang, and gruyere for the smoothness of flavor and mozzarella for the melting factor. Thank you again for the great Instant Pot recipe. Lay a kitchen towel over it when you release. Do I take out the noodles after draining and add thwm back after i made the sauce or before? Drain water and leave noodles in pot. 3 minutes is definitely to long to cook pasta in the IP unless you like your pasta to be more like mashed potatoes. Everyone has their preferences but I’ve used our IP for over a year and made hundreds of recipes and 3 minutes is always perfect for us. I do noodles a lot in my instant pot and 3-4 minutes is always perfect for us. In fact I even did it for 5 minutes last night (on accident) and they were just perfectly soft, still a bit of firmness to them. I wonder if you aren’t doing a quick release on the pressure? If you’re letting it come all the way down on its own then it would certainly be too long and be mush. This was really good! I didn’t have evaporated milk, so I subbed in 1/2 heavy cream and 1/2 2%milk- definitely creamy! I also added a couple slices of American cheese, so only 2 c shredded Monterrey jack. A couple dashes of hot sauce and some fresh ground pepper really added to the flavor as well. Thanks! I made this a couple weeks ago and I am in love! I’m going to make it again tonight…it’s a keeper! I was just given a 10 qt IP, do i have to change recipes that are provided to make the same amount in such a large pot. Worried about building enough pressure. I have a 6 qt. so not sure but with a smaller recipe like this you may want to double it so it doesn’t burn but use same cook time. For larger recipes like my soups you should be fine. the quick release spewed water everywhere …and a lot of it! something I should do differently? thanks! Hmmmmm….just move it slightly so the steam comes out very slowly next time. I don’t have evaporated milk, but I have coconut milk (can) and whipping cream. Can I use the alternatives that I have? If so, which is best? Would I use the same amount, 1c? Should be fine, just a different taste. Use as much as you like depending on how thick you desire. Add smaller amounts until it reaches the consistency you like. This recipe sounds great for something quick and easy but I don’t have an “instant pot.” So you mentioned art the beginning that you made it on the stove top too. Can I assume that you melt the cheese with the evaporated milk before adding the cooked macaroni? Do you think you could use Banza chickpea pasta in this recipe? I am new to Instant Pot and this recipe sounds delicious. If I wanted to make it for one or two people, how wold I go about halving the recipe? I know that you just can’t do half of everything with the instant pot. You could try and split it in half if you have a smaller pot, it should be fine I’d think. Why evaporated milk? Why not 2%? I just don’t want to buy extra milk. The evaporated milk acts as cream without all the calories and fat. It makes cheese dishes taste richer. Try adding the cheese slower so it doesn’t clump. I haven’t had this issue but I imagine that is what happened. Agreed. Never (!!) make mac and cheese with pre-shredded cheese! It’s coated with anti-caking agents that can really degrade the end results. Your website has so many great recipes but also has sooooo many ads! They’re very distracting to the point of annoying. JMHO. I love providing a free website for everyone to use and gather recipes. It is very expensive to run a website and ads provide the revenue necessary to keep it free for everyone to use. So I rushed to make this about 3 min after my instant pot was delivered as dinner was late and i was depending on it to arrive earlier. I’m new to IP so I rushed reading the directions and doubled this and cooked it on Hugh. There was a LOT of water in the bottom. Was it supposed to be there? I am going to drain it to make the sauce but since that’s not in the directions I wanted to ask anyway. If there is a lot of water yes I would drain it to make it thicker in the end. Different types of macaroni noodles cook a bit differently and some absorb more than others, thus the difference in amount of water left. I have an 8qt ip yesterday I put A jar of spaghetti sauce and frozen meatballs in mY ip. I tried the soup stew button and it scoRushed on the bottom. What went wrong? Also curious if there is enough room to double the recipe. My husband is an avid cyclist who is always trying to carb up before a long ride, and eats a lot of pasta. There probably would be for this one, yes. You should try my Instant Pot spaghetti recipe too, that makes a lot in just 10 minutes flat! Instant pot is wonderful. A definite time saver!